Don’t want to go through a ton of disposable batteries to power your digital camera, console controller, flashlight, wireless microphone, children’s toys, or other items? If so, then what you need to feed your devices are rechargeable batteries! Most devices call for AA batteries. Rechargeable batteries like these can be used again and again, conserving space and budget while also cutting back on waste. There are a number of different types which are ideal for different purposes. In this article, we will help you to choose the perfect AA rechargeable batteries for your needs. 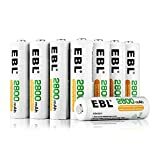 But first, here is our comparison table for the top-selling highly rated rechargeable AA batteries for sale on Amazon.com. Still not sure what type of rechargeable AA batteries you need to buy? Read on to learn all about the different types and important features and considerations. What is a Rechargeable AA Battery? A rechargeable AA battery is exactly what you think it is going by the name—it is a AA size battery which you can charge again and again so that you can use it over and over. These are ideal for high-drain devices which are used continuously. These “hybrid” batteries are also best for high-drain devices. Use these for power tools and two-way radios. These are also good for devices which are being operated at high temperatures. These are excellent for sensitive electronics such as digital cameras, camcorders, notebook computers, and mobile devices. While these are good for some devices, they can only be recharged a few times and they are pricey, so they are not very popular. These can only be charged a few times before they need to be replaced, but they are ideal for very small devices. They are extra lightweight. How Does a Rechargeable AA Battery Work? Rechargeable AA batteries go in your device just like standard single-use AA batteries. After their charge is used up, you remove them and you put them in a recharging station which you plug into the wall. You wait a few hours for the batteries to recharge, then you put them back in your device and use them again. What types of devices do you need to power? This will determine in large part which type of rechargeable batteries you need to buy. For example, if you want to power a digital camera and get peak performance, you should buy lithium batteries. Otherwise you could end up with scan-lines and other distortions in your photos. Where will you use the devices? If you will use your batteries in especially hot or cold locations (while on a vacation at a ski resort for example), you should make sure you buy batteries which are built to operate even in extreme temperatures. Look for a high capacity in your batteries, optimally 2000mAh or higher. This is how much power each battery can hold. The self-discharge rate tells you how much of a battery’s charge can be maintained if it goes unused in storage for a certain period of time (usually a year). Something around 60-80% is good. This has to do with whether you can recharge a battery fully if it is partially discharged. In the past, rechargeable batteries had what was known as a “memory effect” where they could only be recharged up to full capacity if they were completely discharged first. Now many modern batteries lack this effect, which is a good thing. You can always charge them up to full without using up the partial charge first. If you will use your rechargeable batteries in hot or cold conditions, look for batteries built to withstand extreme temperatures. As you can see, the world of rechargeable AA batteries is a little more complex than it may appear at first glance—but now you know everything you need to in order to make the right purchase. Scroll back up to our comparison chart to shop! Eneloop batteries are as powerful and versatile as they are Earth friendly. Eco-conscious shoppers appreciate that Panasonic uses solar panel energy to provide its Eneloop rechargeable batteries with their initial charge. Electronic hobbyists, on the other hand, appreciate the way that they perform well in cold weather conditions. Thousands of recharges. To wear out one of these batteries, you’d have to drain it and charge it back up 2100 times. Holds a charge well. Charge up one of these batteries today and you’ll be able to use 70 percent of its power a decade later. Ready to use. 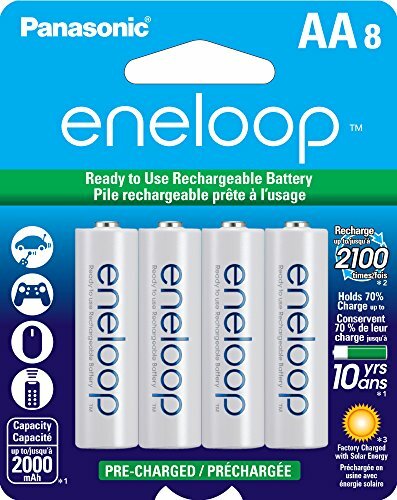 Eneloop batteries come pre-charged, so you can start using them as soon as you take them out of the package. Earth friendly. Panasonic uses solar power panels at the factory to give these batteries their initial charge. Works well in cold weather. Some batteries lose their charge when it gets cold, but these ones work just fine– even when it’s 4 degrees below zero. Improved technology. These batteries were quite strong when they came out in 2005, but new improvements have made them even more efficient. Panasonic quality. Panasonic’s commitment to quality and r&d is evident in these excellent rechargeable batteries. Though it is nice that Panasonic charges these batteries at the factory, it is slightly annoying that they are often not charged to full capacity. When you think of batteries, Amazon is probably not the first brand that comes to mind. But if you are looking for cheap reusable batteries that perform surprisingly well, the AmazonBasics line rechargeables match up quite well against the big names. They perform especially well in high drain gadgets and come in a box that’s made out of recycled cardboard. Low prices. Even though these batteries outperform several major battery brands, they are a lot less expensive. Easy to open package. Most batteries come in stubborn plastic containers that you have to rip open, but these ones come in a reusable brown cardboard box. They come pre-charged. Amazon charges these batteries at the factory before shipping them out so that you can use them right away. Performance beats popular battery brands. 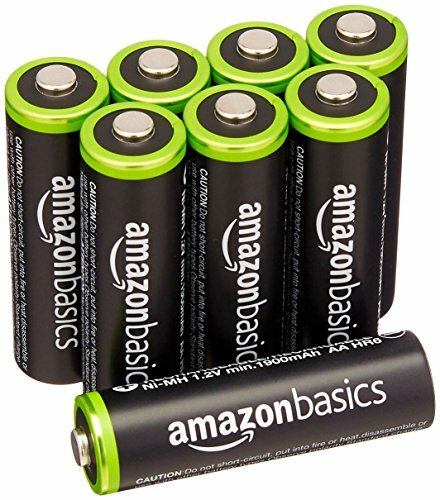 Though AmazonBasics batteries are inexpensive, they’re also right at the top of the list when it comes to performance. Perfect for high drain devices. These all-purpose rechargeables do surprisingly well in high energy use devices like electric toothbrushes and cameras. Stronger flashlight beams. If you use these high powered batteries, your flashlight will shine brighter than it ordinarily does. Amazon support. If you ever have a problem with these batteries, Amazon’s excellent customer support people will assist you. Even though Amazon’s batteries are cheap and perform quite well, some other brands are slightly more efficient.